Pollination Failure Due to Herbicide? Herbicide injury seems likely culprit. Herbicide application timing, crop growth stage and weather probably all to blame. eginning several weeks ago, I began to receive reports of severe kernel set problems in fields of specialty trait corn hybrids resistant to certain ALS herbicides. Otherwise known as CLEARFIELD hybrids, these varieties are commonly used in a production system that involves the postemergence use of Lightning® herbicide (imazethapyr & imazapyr). The first reports I received came from western Kentucky, then from southwest Indiana and, most recently, from westcentral Indiana. The hybrids most commonly implicated are two from Pioneer Hi-Bred International, but hybrids from other seed corn companies have been afflicted with the severe kernel set problem also. Most, if not all, of the reported fields were treated with a postemergence application of Lightning® herbicide alone or tankmixed with other postemergence corn herbicides including Distinct® (diflufenzopyr + dicamba). 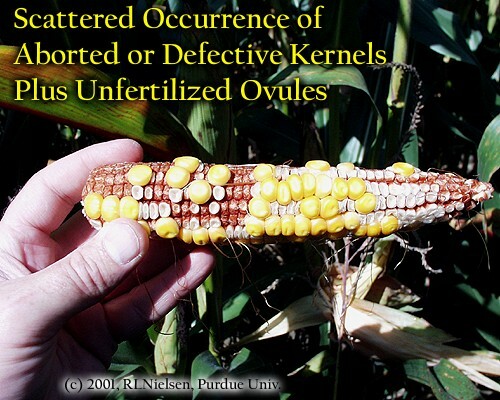 The symptoms include severely scattered kernel set on the ears in varied combinations of successfully developing kernels, unfertilized ovules (blanks) and rather large, white aborted or defective kernels. 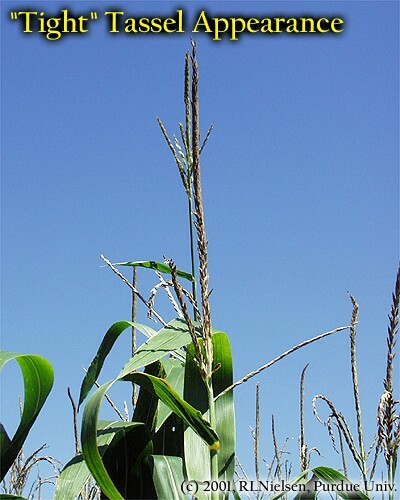 The corn plants themselves look normal in terms of height and color. NOTE: The 'thumbnail' images below are linked to larger versions. Simply click on the image to 'pop up' a larger one in a new browser screen. Close the 'pop up' screen to return to this page. In the fields I walked last week, however, the tassels appeared to be nearly sterile. That is to say, the tassels had a tight appearance with few open glumes and very few visible spent anthers. 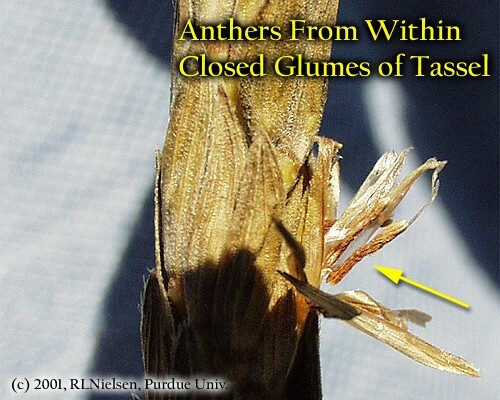 Withered anthers could be dissected from within the closed glumes throughout the tassel; strong evidence that anther exsertion and pollen shed never occurred. 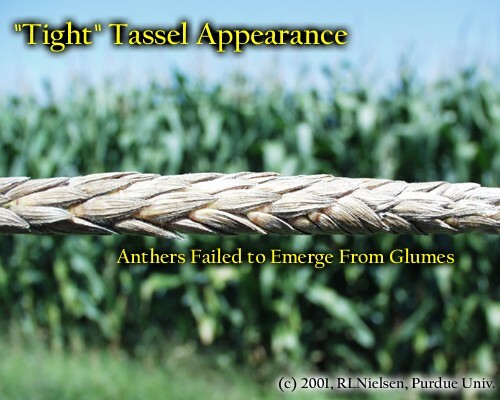 Glumes near the tips of the tassel branches were more open and devoid of anthers, suggesting that pollen shed had at least occurred at those points on the tassels. Needless to say, such a high degree of tassel sterility is not conducive to thorough kernel set on the ears! 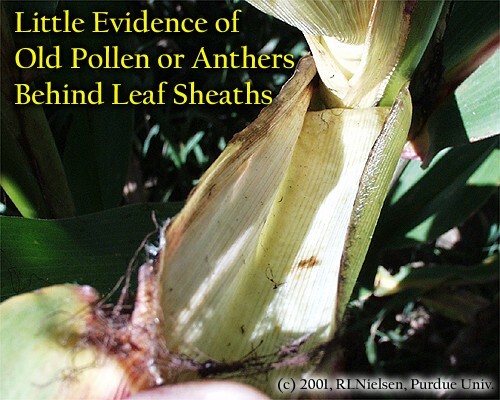 Related to the appearance of the tassels, there was little evidence of old decaying pollen and spent anthers on the leaves, behind leaf sheaths or on the ground. 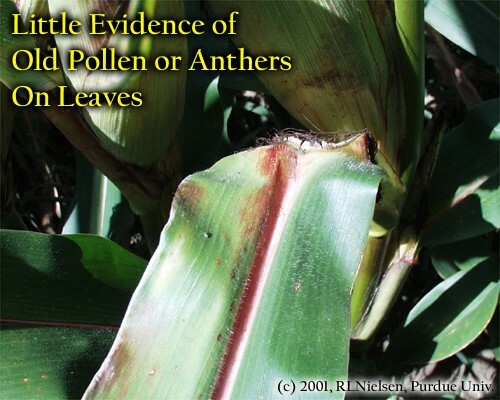 In fact, some of the fields I walked were striking in the exceptionally clean condition of the leaves and leaf sheaths (no pollen crud or spent anthers) given that the fields were well into the dent stage of kernel development. 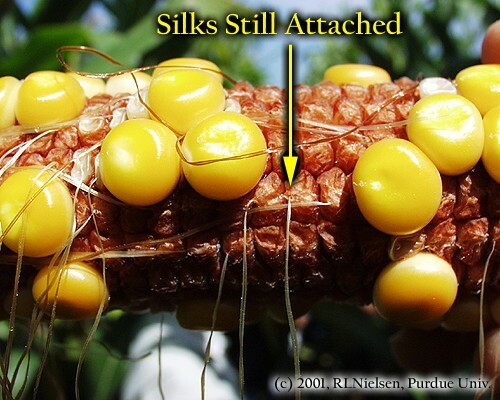 Silks were often still attached, albeit collapsed, to both unfertilized ovules and aborted kernels on the ears, suggesting that pollen tube growth in the silks never reached the ovaries or that viable pollen was never captured by the silks in the first place. 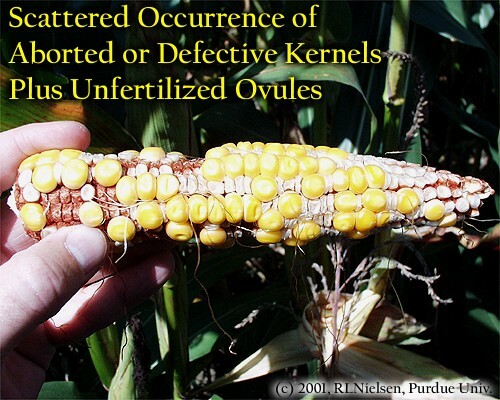 Some of the large white aborted kernels did not contain an embryo, suggesting incomplete or defective fertilization of the ovary by the pollen nuclei. Remember that the radicle root, coleoptile, and first embryonic leaf of the embryo typically form by the blister stage of kernel development. 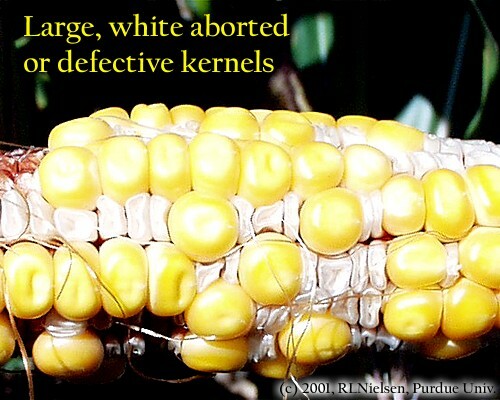 Yet, the aborted kernels were much larger than expected if they had aborted pre-blister. 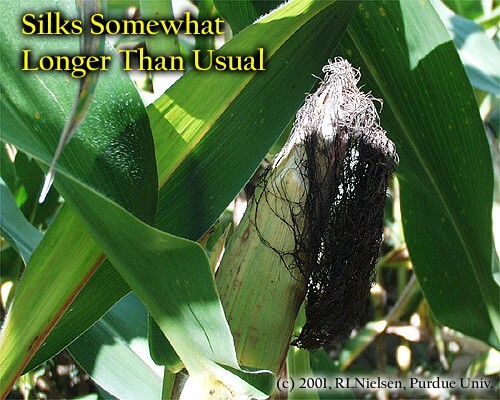 The upshot of these reported kernel set problems is that a) pollination failure appears to have been caused by a combination of nearly-sterile tassels and possibly non-viable pollen, and b) kernel abortion was caused by a combination of late pollen capture by the silks and/or possibly defective pollen. Some of the reports claim that the kernel set problem was less severe in rows adjacent to a normal field of corn from which pollen may have drifted into the outer few rows of the affected field. Somewhat relatedly, I observed that the problem was more severe in the outer few rows of corn adjacent to a soybean field, from which obviously no corn pollen would have drifted. In at least one field that I visited, the symptoms were clearly more severe in spray overlap areas of the field. In other fields, the symptoms were distributed nearly evenly throughout the entire field. 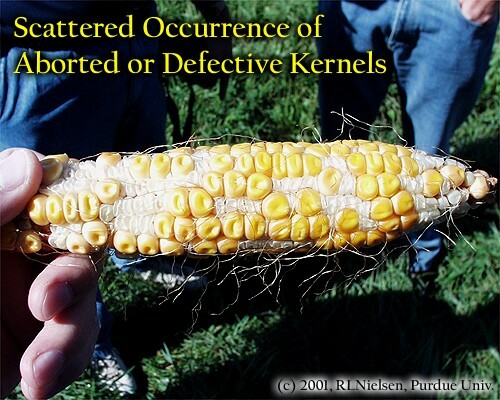 It is important to recognize that these scattered kernel patterns are NOT similar to simple barren ear tips (see accompanying article). Consequently, folks should be cautious in diagnosing other fields with apparent similar barrenness problems. The problem is also NOT restricted to a single hybrid or seed company, but has been observed by yours truly in hybrids of at least two different seed companies. 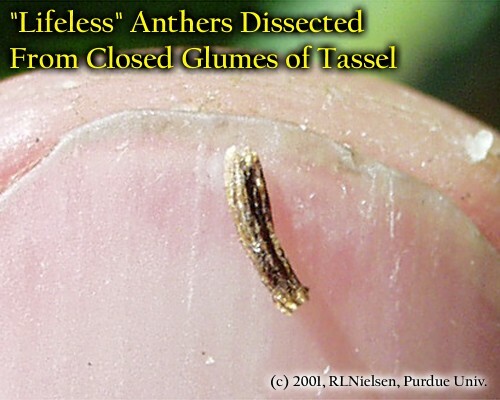 Some reports have suggested that similar barrenness exists in genetically related non-CLEARFIELD hybrids (obviously not treated with Lightning®) and in CLEARFIELD hybrids themselves not treated with the herbicide. I have walked a number of fields and variety test plots this past week with untreated CLEARFIELD hybrids and their related non-CLEARFIELD counterparts, but have not observed the exact same symptomology as exists where the herbicide was applied. Thats not to say that kernel set is perfect in untreated fields and test plots around the state. 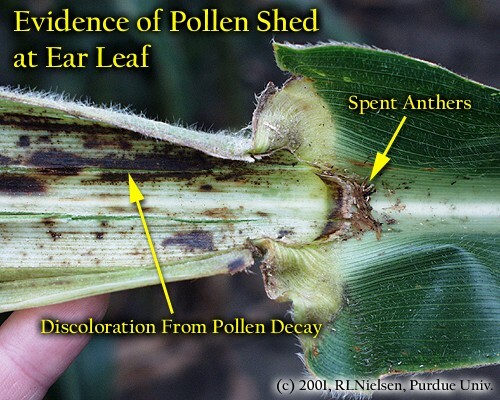 Indeed, ear tip fill is often poor and severely scattered kernel set does exist in some untreated fields. 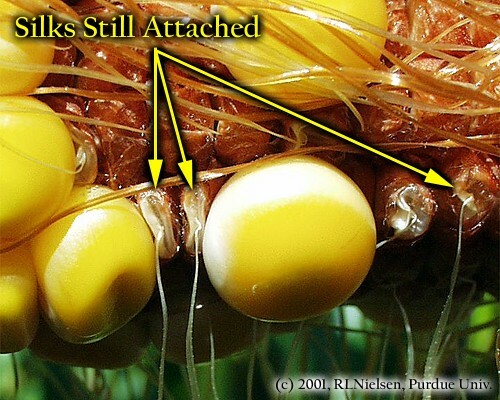 However, where I have observed such kernel set problems in untreated fields, there has always been evidence of severe silk clipping by corn rootworm or Japanese beetles (see accompanying article). Conversely, the silks of problem ears in the Lightning®-treated fields Ive walked were, if anything, obvious by their somewhat unusual length; another signal that pollen availability was limiting. So, if this version of a severe kernel set problem is related to the application of a postemergence herbicide, why did it occur this year? A couple of contributing factors can be implicated, all of which are obviously difficult to document at this point in time. First of all, crops throughout the state were stressed by the unusually lengthy cool period from about mid-May through early to mid-June. Applications of certain postemergence herbicides, including Lightning®, when crops are experiencing or recovering from such chilling stress increases the risk of crop injury partly because the crop cannot detoxify the herbicide well. Secondly, the lengthy cool period transitioned quickly to a period of exceedingly rapid corn growth as temperatures warmed quickly into the high 80s and low 90s in mid- to late June. 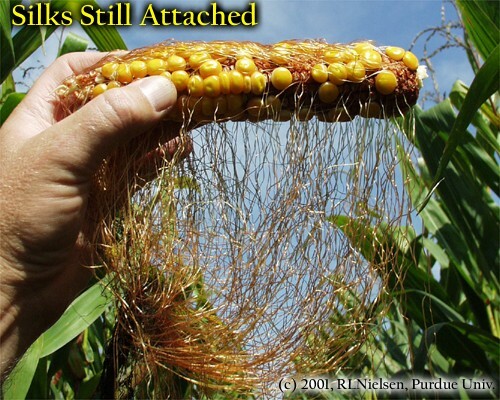 Application of ALS herbicides during periods of rapid corn growth has been implicated with crop injury in the past, presumably because a) the herbicide is rapidly translocated to meristematic areas before it can be detoxified and b) those meristematic areas include the developing tassel and ears. Thirdly, the descriptions I have heard of the herbicide application timing suggest that label restrictions for corn plant height and the use of drop nozzles were stretched a bit in some of the affected fields. If true, the risk of crop injury would also be greater. Whats to be learned from all of this? The fact that not all fields planted to CLEARFIELD hybrids and treated with Lightning® herbicide were afflicted with pollination failure tells us that the production system itself is inherently NOT to blame. Rather, it appears that field-specific combinations of application timing relative to crop growth stage, use or not of drop nozzles, and the occurrence of other crop stresses were all involved in determining whether pollination problems occurred in any particular field. As with most herbicide use, one of the lessons from this should be to adhere to herbicide label restrictions whenever humanly possible.